It's party time again. Time for you to wow us with your latest projects, crafts, recipes, room reveals, etc. I look forward to what you have to share this week, but first let's take a look at some features from last week. Potting bench turned into a beautiful outdoor bar. See how they transformed it at The Creativity Exchange. Dimples and Tangles shares her log filled fireplace. This looks like such a beautiful spot to sit. My Simple Messterpiece shares this wonderful table that her husband built and she painted. Love this lettered pillow by Simple Details that she created using a sharpie. See how to make this padded headboard by Recaptured Charm. Wonderful Restoration Hardware knockoff planter by Grey Lane Home. Such a serene bedroom created by Live Love DIY. Sweet Chaos shares her beautiful new mirrors in her bathroom makeover. Great new life for an old door is shared by Ribbonwood Cottage. Now I am looking forward to what you have to share with us this week. Great features as always Kim. Thanks for hosting. Wonderful features that you chose, Kim. They're all great, but I love the patriotic door! Thank you for hosting! Great features - in love with the flag. Thanks for hosting. Kim....I love the features (especially that red white and blue door)! Amazing! Great features, and a fab party as always. You are a lovely hostess Kim. These features are beautiful, Kim. That flag door and Sharpie pillow are amazing - definitely on my to do list! The flag is my favorite this week but there is a lot of good stuff here. Thank you for rounding everyone up to share our stuff! Terrific features Kim! Thanks for hosting. Such magnificent features...so many creative and talented people...! !...Thanks for hosting Kim! Have a wonderful week! Awesome features Kim!! Thanks so much for hosting! I don't know how I missed that flag, but it is awesome! Great features as always, Kim. Thanks for hosting WUW every week. Love the features - especially the wood filled fireplace. Cute. Thank you for hosting Kim. Great features as always. I love that potting bench transformation. Beautiful party already! Thanks so much for hosting! So many wonderful creations! Thanks so much for hosting. Awesome features Kim. I missed a few of those! Thanks for hosting! The features were great, Kim. Loved how clever the logs in the fireplace was! Thanks! Great features! Thanks for hosting Kim! Wonderful features, Kim. Thanks for hosting. Beautiful features Kim! I finally opened my first can of chalk paint this week. I have now ordered 2 more colors. It takes a little getting used to, it dries really quick. Thanks for hosting! I love, love the flag door. It's fantastic!! Hi Kim, love that patriotic door! Just linked up, thanks so much for hosting! Thank you for hosting! I love that patriotic door...so awesome! Kim, Great features again this week. Thanks for hosting. Thanks so much for hosting your party for us, Kim! Love the features that you selected. I also enjoyed seeing your "new to you" scale and bird's nest arrangement. Your hydrangea looks fabulous this year. Wow, that potting bench bar looks amazing! I'm off to check that out right now! Thanks so much for having me today Kim. Oooh...so many beautiful and inspiring posts that you showcased this week, my friend! Thank you so much for hosting another week of WOW! 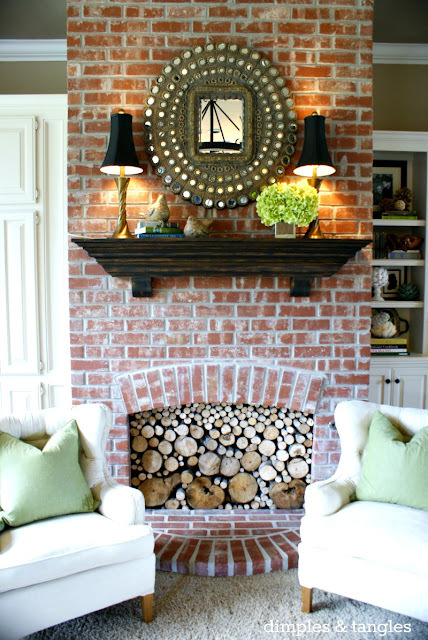 Love that fireplace by Dimples and Tangles. Cute name for a blog, too! Thanks for hosting, Kim. Hope you're doing well, Kim! Thank you for hosting this week. Love your next, I have a BIG collection of birds' nests. I take them to school for my students to draw! Thank you so much for doing this. I agree with the others. I enjoy looking through these so so much! Great for new bloggers. Thank you so much for the feature, and hosting this fabulous link up! Have a great week, Kim. Thanks for hosting. Thank you, Kim! Such an honor to be included in your features, there is always so much creativity I don't know how you could possibly choose! Thank you for featuring my fireplace, Kim! How great to be included with such fantastic projects! Scrolling through your features is like thumbing through a magazine! Just gorgeous! So glad to be here this week, seems like I've been a "day late and a dollar short" the last few weeks. Thanks for hosting Kim! Thanks for hosting Kim! Love the features - especially that potting bench turned outdoor bar! Thank you, Kim. It's always nice to take part in the party! All linked up! So glad to be partying with you this week! Thank you! Thanks Kim! Love the features. Hi, Kim! ~ Though I became a follower of your lovely blog a while back, I haven't participated in "Wow-Us Wednesdays" until tonight ~ can't wait to peek in on some of these great-looking projects! Thanks for hosting. I can't wait to do some visiting. I see some great projects linked to your party. Thanks so much for hosting, Kim! I was particularly inspired by the slipcover tutorial on the Cedar Hil Ranch site -- I have a swan rocker that I would love to cover this way! Thank you for hosting! Great features!! oh my goodness!!! some awesome features! I have been wanting to do a bar like that forever.... so cute. thanks for hosting! Stopping over to their blogs to pin the bar and flag door. Always on the lookout for a project I think I can do. Love all the features! So many great links. I'll be here all day! Thanks for hosting. Thanks so much for hosting. Look forward to seeing everyone's links. Thanks for hosting again this week. All linked up and ready to check out the others! Yup, I am a new follower! and I thought I would join the party. Love a great party! You had some really lovely features ... makes me think I should check out a couple of back parties :) Thank you for hosting! I'm so glad I made it in time to join your party! Thank you for hosting Kim! Thanks for hosting the party. Looks like lots of awesome stuff to check out! Kim, wonderful features...thanks so much for hosting! I've met so many great bloggers on your Wow Us Wednesday feature. Thank you so much for hosting. I am joining in this week Kim~what a blow out of a party you have started over here!! Thanks for hosting! Many thanks for hosting - can't wait to look around! Kim without a doubt you have the most talented and creative bloggers link up to your parties. I love your standouts and I love so many of the great things these gals do. It is just a joy to be apart of all of this. Thanks for hosting such a wonderful party each week. Those are some great features! Loved the logs in the fireplace. Great features - could that flag door be any cuter?!! Thanks for hosting! Thanks so much Kim for featuring me. How exciting for me. Your features are awesome. I visited the original sites and pinned tons of them. Thanks so much!